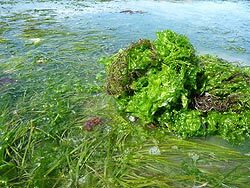 Discharge of nutrients into the water from stormwater, sewage outfalls, factories or from general agricultural run-off, may cause algal blooms and excess algal growth on seagrasses. Both of which restrict light reaching the plants and reducing the oxygen supply in the water. 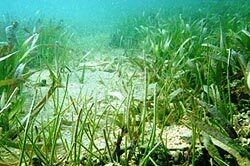 Seagrasses can build up the levels of toxins, such as heavy metals, from the environment in their roots. These toxic chemicals can then be passed up the food chain by animals eating living or decomposed seagrass. Oil spills can also damage seagrass by directly poisoning or smothering the plants. The removal of bottom sediments may destroy seagrass beds. Sand dredging often increases the depth, so light does not penetrate deep enough for seagrasses to grow. Dredging can also release large amounts of sediment into the water, which may smother seagrass beds or other aquatic life, while the resulting high turbidity inhibits the growth of seagrasses. The clearing of land vegetation in steep areas, particularly along or near river banks, often leads to erosion and the washing of sediment into waterways.When this turbid water flows into the sea, rapid siltation smothers and destroys seagrass beds. 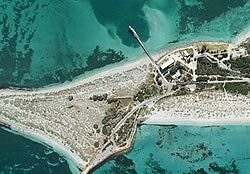 Construction of structures such as groynes, breakwaters, break walls, jetties, wharves, bridges, ramps, pontoons, marinas and various aqua cultural facilities (e.g. fish farms) may alter the natural environment causing physical changes and shading of the waterway affecting seagrass beds in the ecosystem. They can also affect water movement restricting the extent and health of seagrass beds. 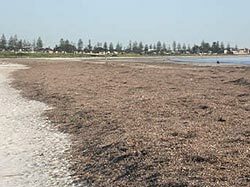 Boats causing damage to seagrass beds is common. Anchors and mooring chains from boats pull up seagrass when they are retrieved or dragged. Boat propellers may tear up and damage seagrass when operated in shallow water. underside of ships, can lead to dramatic effects on the native species. These are natural sources of damage to seagrass meadows but the threat of climate change means that these events will occur more frequently in the future. 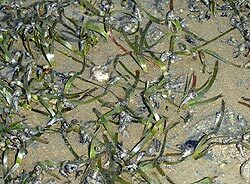 Seagrass wrack (leaves detached from the original plant) plays a vital role as a microhabitat both in the water and along the shoreline. Its removal decreases food, shelter and nursery areas and alters food webs, as well as disturbing nutrient cycling within an estuary.